Is your couch or car upholstery in need of a little TLC? 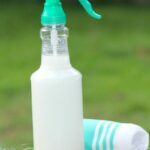 This homemade upholstery cleaner will remove stains and help sterilize the area too! This DIY cleaning tutorial has many positive reviews – it works! Over the past few years, I’ve worked very hard to switch to all natural cleaners, most of them homemade. Until recently, I had not tried to create a homemade upholstery cleaner. I finally decided to give it a try and came up with something that works great on most upholstery! If you don’t want to make it, you can also buy organic upholstery cleaner on Amazon. 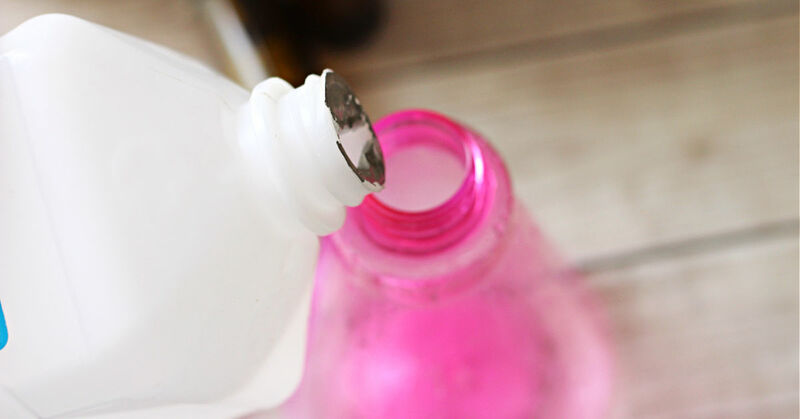 Whether your couch needs a freshening or your car upholstery has seen better days, this easy homemade upholstery cleaner with only 3 ingredients can take it from blah to brand new. I originally started using this on a microfiber couch and I was so impressed with how well it removed stains that I gave it a try in the car and found it to be just as effective there! You will want to use this mixture in an open space. If you’re using it indoors, open up those windows! When wet, the smell is overpowering, but it dries with no odor other than the essential oil scents you choose. Also, it is always a good idea to try this in an inconspicuous place to test the surface you want to clean for discoloration before using on a larger area. If you give it a try, will you let me know how it worked for you? Watch this short video that includes reviews, then make your own DIY upholstery cleaner! Or you can buy organic upholstery cleaner on Amazon. Combine all ingredients in a spray bottle with a fine mist option. You’ll want to use equal parts rubbing alcohol and white vinegar. Add 4-8 drops of any essential oils you like. If using citrus oils, you will want to store your cleaner in a glass spray bottle so they do not eat away at the plastic. My favorite combo for a fresh clean scent is lavender oil and rosemary oil. Before you follow the usage instructions, be sure to test in an inconspicuous place. Spray fabric surface generously with your homemade upholstery cleaner mixture, and allow to sit for 1-2 minutes (do not let it dry). Scrub vigorously with a sponge or clean towel, then allow to dry (the alcohol helps this dry rather quickly) repeat if needed to remove stubborn stains. Once dry, this homemade upholstery cleaner is odorless except for the essential oils scents you add. I have had very good luck removing all sorts of stains from my car upholstery and couches as well. Being a mom who knows what often ends up on them, I love knowing that the essential oils, alcohol and vinegar all kill germs as well as remove stains! Buy Organic Upholstery Cleaner Here. How would you use this homemade upholstery cleaner? Ohh I love this!! I have been working on switching our cleaning supplies over to natural cleaners as well. I have not found anything for cleaning upholstery that actually works so I’m happy to have found this our furniture and cars could surely use a good cleaning with 6 kids they sure get trashed lol. Thanks for linking up with Inspire Me Monday. Have a wonderful week!! Awesome! Will you let me know how it works for you? This mixture worked great on fabric upholstered sofa that smelled like cigarette smoke. Also, I use 100% alcohol on my entry halls shiny tile. Great. No water smears. Thanks for this post..Its really seems to be helpful for me.. I haven’t seen anything homemade that works well at cleaning upholstery. This is something I should try, but thanks for the warning about the strong smell because it would have probably bothered my cats quite a bit. Does it have the overpowering smell while your making it too, and if so, should I do that outside as well? Wow! The before and after pictures of your car’s upholstery shows that your cleaner is the real deal! I didn’t know that rubbing alcohol and vinegar made such a good cleaning combination. Adding essential oils is a great idea, too. I’ll definitely be using this recipe next time my kids spill something in the car. Thanks! Essential oils are a great addons to home made cleaners. And oils like eucalyptus can enhance the cleaning power of the solution. It can remove greasy stains from a variety of surfaces. This worked amazingly for my milk filled back seat! What’s the measurements of ingredients. It depends on the size of your bottle. The ratios are in the instructions. Great advice! It’s important to use the alcohol to kill all the germs when you clean. Thanks for sharing this! Wow, great cleaner. I tried it and got much better results. Use should try it once.Thanks for sharing! The glass spray bottle is a unique tip. You do not want those ingredients to eat away at the plastic, especially not the essential oil, which can be expensive. OMG this is a LIFE and MONEY saver!! Between a baby and two dogs my furniture qas looking like a biohazard station! I really thiught I was going to have to spend thousands on leather – SO grateful incame upon this recipe and actually tried it!! Thank you for this!! My before/after wont post but it is DRAMATIC! I’m so glad it has worked to so well for you! Well I ran out of upholstery cleaner for my vehicle, and did an online search – this came right up. Well I had the ingredients on hand, including peppermint oil. The alcohol, vinegar and oil make an amazing clean smell. I have dark seats so I can’t really see stains, but I can tell you they looked darker and even, so I’m sure some stains came out. Thank you for sharing this homemade cleaner! The before and after pictures were pretty impressive, and it’s cool that it works on more than one surface! Can you share how much rubbing alcohol and vinegar to place in the bottle? Never mind. Reread the recipe and found that it is equal parts. Thanks. Thank you so much for sharing the recipe. I searched high and low at all the stores for an upholstery spray cleaner and couldn’t find one. And had I been able to find one, I’m sure it would have been very expensive. I have a few other homemade cleaning recipes and it suddenly occurred to me that I could probably find a homemade recipe for an upholstery cleaner as well, so I googled it and quickly found your blog. I tried this homemade cleaner to get out some spots on my sofa and it did a fabulous job. That’s great to hear Lynne! Thank you so much for this wonderful tip! I am very thankful to you, my mom needs one for cleaning! I have bookmarked this post so that my mom can later learn it from it. So how much of each item do I need in a bottle ? It depends on the size of bottle you use. 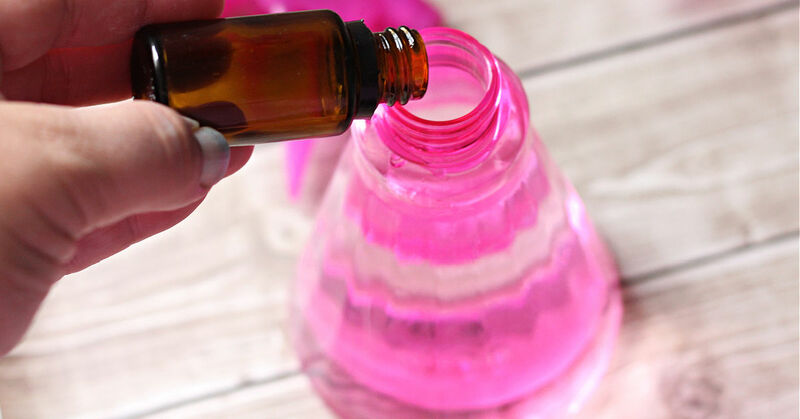 Just use equal parts rubbing alcohol and white vinegar in your bottle. Will the essential oil stain the upholstery? It hasn’t stained mine! But don’t use cheap essential oils with fillers in them. If in doubt, you can leave them out. I always recommend spot testing first because every material is a bit different. I must admit I came to the “green-life” trend a bit too late, but I am a full-fledged convert now! I am also trying to avoid any chemical-based detergents because my niece has allergy problems. 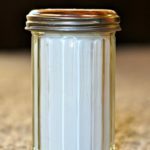 A quick question – I believe the white vinegar is the main cleaning component in the mixture. Do you add the oil for aroma only? Or does it help the mixture go deeper in the fabrics? It’s never too late Carole! The oils are definitely optional, but certain oils like Lemon oil and Melaleuca oil do have great cleansing properties. They aren’t critical to the mixture, but they do add to the cleaning power. Our sunroof has leaked in our van! I sure hope this works. I am posting the link on my Facebook blog page! Thanks for sharing the recipe. Be sure to come back and let us know how the upholstery cleaner recipe worked for you! THANKS so much for sharing! The back seat in my car was ridiculous! Too embarrassing to post pictures. My husband took the backseat out to replace a part and refused to put it back until it was clean! I skipped the essential oil because I only had lavender on hand (I’m trying to reserve that scent to associate with bedtime for my daughters.) I made a spray bottle full, but the mixture worked so well that I really only needed about 8 oz of it. Works great! Smells clean! Can the vinegar be white cleaning vinegar from Bunnings or just plain white vinegar from supermarket? What about a large amount of spilt milk and its smell? Is it safe using essential OIL on fabric – won’t stain? Just checking as I know you invented it and have tried it and it works for you? Any white vinegar should work. Every piece of fabric will different, so it’s always good to spot test first. sorry from last comment – it was for car upholstery? Can this be used on upholstery such as a sofa that is cleaning code S? I always suggest spot testing in an area that isn’t highly visible first. I haven’t tested it on all upholstery fabrics. Wow, bought a jalopy from neighbour who smoked! One treatment removed all traces of tar stain from headliner, seats and large oil stain in boot! Cheers for this recipie, will do spot checks first and try stains on stair carpet, sofa, and Timberland boots! What is the drying time after you’ve cleaned the uplostory? 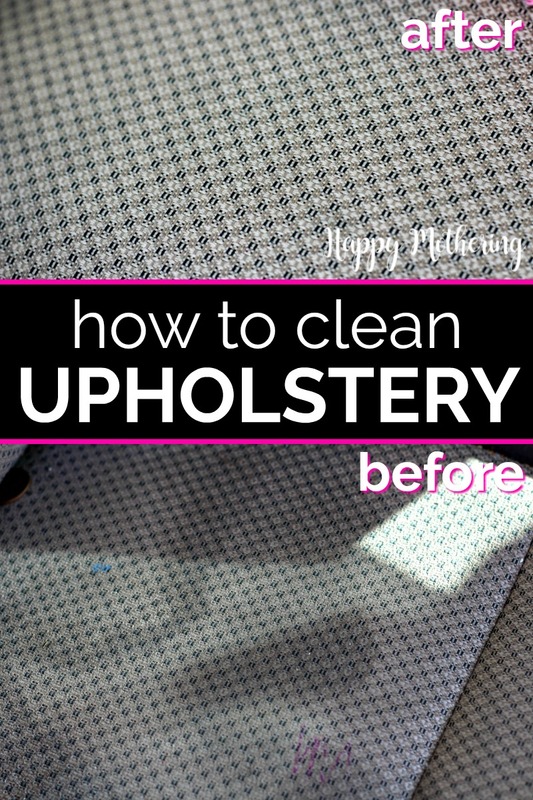 It depends on the humidity in the area and how heavily you saturate the upholstery, but it’s pretty quick compared to other methods since rubbing alcohol evaporates quickly. Thank you for this post! I’ve read dozens of posts for carpet/upholstery cleaner and they all use Dawn dish soap—-which is a great spot cleaner, but car upholstery can’t be rinsed easily! I know from experience that the soapy residue will attract dirt. Your combination sounds perfect, and I can’t wait to try it. The essential oil addition is genius. I have to admit, I’m not so much into “green” as I am “effective”. In my experience they have been mutually exclusive, except for peroxide…..I’m excited to try this! Wonderful to hear! You’ll have to come back and share how it worked to clean your upholstery after you give our upholstery cleaner a try! Thanks so much for sharing on craft schooling Sunday and great to “meet” you! Sounds like a great cleaner. Thanks for sharing the recipe with SYC. I’m glad to get this formula for upholstery cleaner! Thank you so much for sharing it at the Grace at Home party at Imparting Grace. I’m featuring you this week! Wow!! This worked amazing thank you!! I used it on my microfiber recliner. I thnk I used too much of the vinegar and alcohol maybe though because it smells a little like vinegar still. Maybe I just need to add more EO. Either way, I’m amazed how well it works!! Thanks for sharing! Your before and after pictures was not from the same location. Why the scam? The picture was taken at a different angle. The sun had changed positions by the time it dried. and then set them out in the sun to dry. They are so clean now I can use them again without recovering. Can this recipe be used to clean a microfiber sofa that when new was treated with a fabric protector at purchase? I’m not 100% sure about what was used on your sofa. I would recommend spot testing in an inconspicuous area to be sure. What a terrific cleaner! Used it on my grimy dining room chairs! Like magic (and a bit of elbow grease), the backs of my chairs now look like I had a pro come in and clean them! Thank you! I’m so happy to hear that! Thank you so much for taking the time to come back and let me know how well it worked for you! Wow wow wow this worked on the first try and my light gray couch which looked brown thanks to my two poms and 2 yr old, is finally looking stain free!!!! Will do a second try anyways but I am over the moon happy with this recipe. Thanks soooooo much!!! Saved me quiet a bit of money! I wanted to show you my results!! I took before and after pictures and it’s pretty amazing the difference especially from such simple ingredients. My chairs are so dirty from dog and toddler and I never knew what to clean them with. After just scrubbing one time through I can’t beleive the results! However, it does leave a slight ordor even after drying (at least for me) BUT I probably soaked it more than enough. Chair #2 I might try to use less to avoid excess vinegar smell. 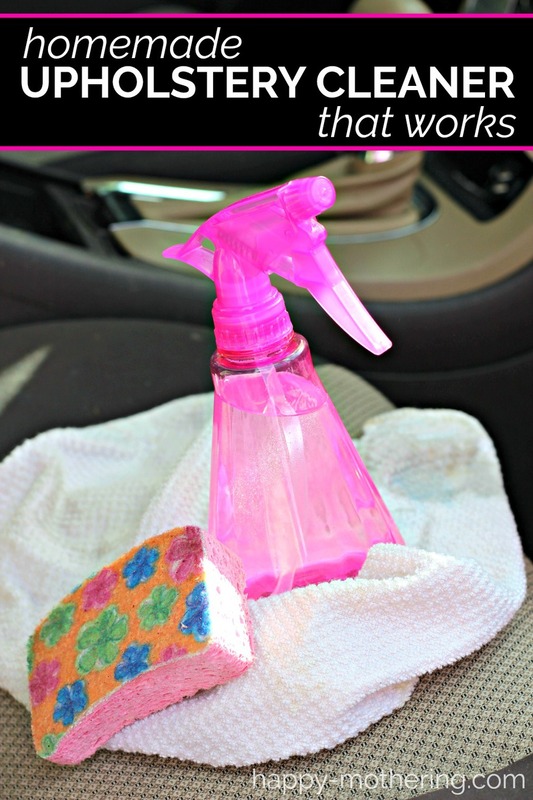 This will be my go to cleaning solution for upholstery for sure! I’m so happy that it worked so well for you! Yay! Looking forward to trying this. I have all kinds of water and tea stains on a light taupe microfiber sofa. Do you have a specific EO you recommend? I noticed suggestions of peppermint, lavender, lemon, and eucalyptus. WOOOOOOOOW!!! We have a pale blue fabric lounge suite and chaise that’s less than a year old. One of our British Shorthair fur babies has made the top of the chaise and pillow “his” and it became quite grey and really grubby looking. We don’t use chemicals in our home so I went looking for a natural DIY fabric cleaner. I REALLY didn’t expect such AAAAAMAZING results. I used a white rag to clean and I couldn’t believe the dirty and oil and grime that came up. I got kinda obsessed actually and went hunting for more furniture to clean! This stuff is a miracle, cheap, natural and always on hand. THANK YOU a MILLION times for sharing! Thank you so much sharing! I’m so happy it worked so well for you!